Gov. Phil Scott defends his education budget proposal Thursday. Around the Statehouse on Thursday, legislators of all political stripes picked apart Gov. 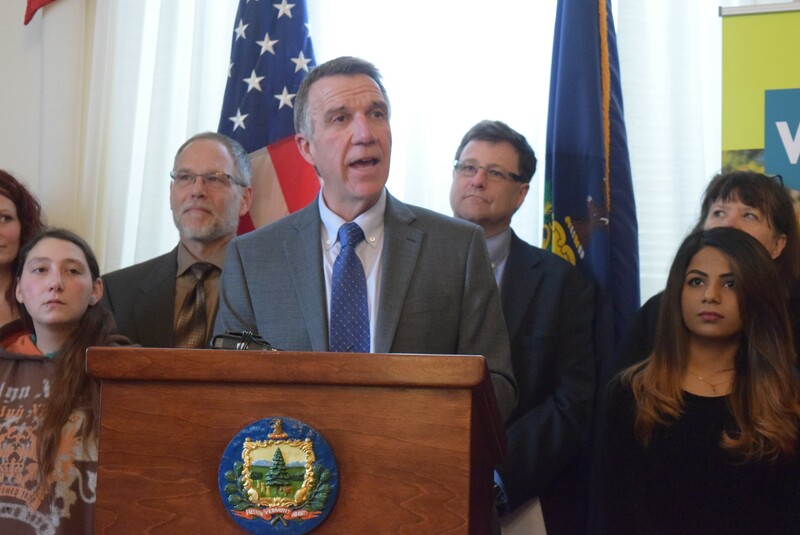 Phil Scott’s proposal to change the way Vermont pays for its schools. Among the complaints: it’s logistically impossible and fiscally flawed. Scott, in his first public appearance since unveiling the plan two days earlier, deflected all of the criticism and defended the plan as an audacious rethinking of Vermont’s education system. On Tuesday, Scott proposed freezing all local school budgets at this year’s spending levels, moving Vermont school budget votes from March 7 to May 23, and mandating that teachers pay at least 20 percent of their health insurance premiums. He would use some of the savings to increase funding for higher education and early childhood programs. Scott said Thursday he’s heard legislators’ concerns, but the newly elected Republican governor calmly disagreed that any were significant enough to scuttle the plans. And, he said, if the majority Democratic legislature can’t agree on the concept, they’re welcome to come up with their own plan. “I’ve placed my pathway, my roadmap of sorts to how we can get there. If they don’t agree at this point, I’m all ears in terms of how we can accomplish the goals of this initiative,” he said. Lawmakers, school boards and superintendents are reeling at Scott’s proposal to change the budgeting process — just as school boards are sending their plans to the printers. Budgets must be finalized no later than February 3 for March 7 town meetings. Scott, who served 10 years as a senator and six as lieutenant governor before being elected governor last fall, dismissed the notion that it’s impossible to get any legislation through both the House and Senate within a week. But doing so would be a tall order because of plodding procedural rules. Scott argued that lawmakers could start by simply moving the school votes to May while they consider the rest of the proposal. Critics said the downsides are plenty. Most communities now vote on both town and school budgets at Town Meeting Day in March. By splitting up the votes, towns incur higher costs. And a May vote would likely have much lower turnout, as well. Karen Horn, director of public policy and advocacy at the Vermont League of Cities and Towns, said her members are assessing the cost of holding an extra vote. In a small town with one polling site, it appears to start at about $400, she said, and would be higher for towns with multiple polling sites. Lawmakers’ questions about Scott’s proposal go beyond logistical. They also said that his promised savings don’t add up. Scott’s 2018 state budget depends on $51 million in savings generated by the level-funded school budgets and 20 percent teacher contributions to health coverage. However, those figures ignore the fact that new teacher contracts wouldn’t take effect until next year. On Thursday, Scott touted the money his budget provides for the Vermont Student Assistance Corporation’s non-degree grant program, which pays for nontraditional students to study trades. Scott proposes to increase funding for such programs by $1 million with money saved by freezing K-12 school budgets. The program succeeds, Scott said, in teaching people skills that land them jobs. He insisted that there’s spare money to be had from the K-12 school system to pay for that kind of education. “We must think differently about education,” he said. Gov. Scott's Education Funding Plan Appears Doomed. Now What?